“Everybody has a different fingerprint. I just think this is my fingerprint.” At Church of God Convention 2017 in Wichita, Kansas, many were first introduced to Vincent Miller, who accepted the role of secretary for the Ministries Council earlier this year. But he isn’t new to the Movement at all. Vincent’s ministry in the Church of God has spanned several states, as has his fingerprint, as he puts it. What is his fingerprint? To pastor ethnically and culturally diverse congregations. Because Jesus is the subject, Vincent knows that diversity does not have to equal division. Because Jesus is the subject, not skin color or language, unity amid diversity can be a powerful witness to the amazing love of God. 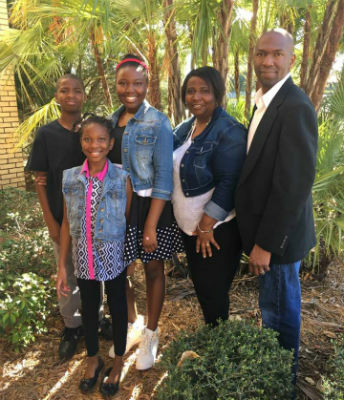 Now entering his second year as pastor of First Church of God in Tampa, Florida, Pastor Vincent Miller is more eager than ever to give witness to the love of God available in Jesus Christ. From the time he left Mid-American Christian University (then Bible College), God led Vincent to minister in diverse settings. His first opportunity drew him to Corpus Christi, Texas, and Iglesia de Dios Christian Outreach—a predominantly Hispanic church known historically for the exemplary leadership of Gilbert Davila. Over the years, he’s served as youth pastor for a multiethnic church in San Antonio, interim pastor for difference congregations, and senior pastor for a church in Champaign, Illinois. Now he looks back at the kind of churches he’s had the privilege to serve, and is both humbled and amazed. 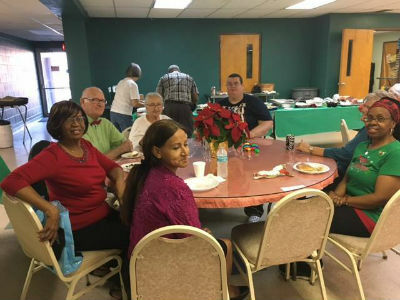 Fellowship at Tampa First Church crosses cultural and ethnic lines. At another location, Vincent served as the youth pastor, under the leadership of a white senior pastor, at a church where the chairman of the board was Hispanic. “That was a cool experience, too!” Vincent exclaims. Unity amid diversity is a witness that Jesus is the subject. First Church of God in Tampa is composed of black people, white people, and Hispanics, including from Cuba, Columbia, and Puerto Rico. One woman has a background from Asia, doesn’t speak English, but accompanies her daughter to worship services. As a result of the diversity, Vincent says he feels totally comfortable inviting anyone from any cultural or ethnic background to church. He knows they’ll fit in just perfectly. And they won’t just fit in; they’ll serve, too. There’s one thing that’s better than a diverse congregation that worships together: a diverse congregation that serves together. 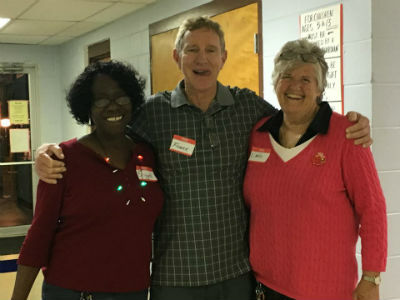 Among a variety of outreach ministries, including a twice-weekly clothing giveway, the church is perhaps most proud of an effort called Trinity Café. The ministry, which is partner of the church, includes volunteers from the church and is based at the church. About 125 people who are considered “food insecure” are fed restaurant style, “with dignity and respect.” Homeless people and those living in great poverty are looked right in the eye and treated like the human beings made in the image of God that they are. Pastor Vincent rejoices that every day, they have the opportunity to meet an incredible cross-section of society, all with the love of a God who sees not the outward appearance, but the heart. And isn’t that what we’re all called to do? In Tampa, Florida, across North America, and around the world, God is on the move in the Church of God. Join the movement. Reach our world. Donate today at give.jesusisthesubject.org. This entry was posted in All Church of God, Southeast and tagged clothing giveaway, Concilio Hispano, demographics, diversity, First Church of God, FL, Florida, food pantry, Grace, Hispanic Council, homeless, Jesus Is the Subject, Ministries Council secretary, multicultural, outreach, race, Tampa, Trinity Cafe, unity, Vincent Miller. Bookmark the permalink.